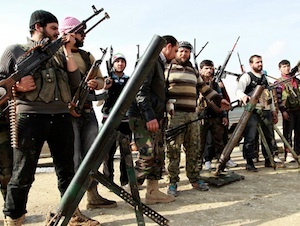 In political terms, the announcement that the U.S. government will openly send arms to Syrian rebels is nothing new. For nearly two years, it has left this task to its more ambitious puppets, the Gulf monarchies, and its junior imperialist allies in France and Britain. But U.S. government cash and weaponry has long been flowing into rebel hands, and now they have decided to cut out these intermediaries. So why now? The notion that the Syrian government has used chemical weapons and thus crossed Obama's "red line" is the explanation we hear from the White House. This is transparently a pretext for military action, and millions of people, remembering the fabricated WMDs "intelligence" in Iraq, will immediately recognize it as such. In fact, any honest study of history would show that the U.S. government has deliberately provoked incidents and distorted events to justify wars that could not be sold otherwise. In World War I, it was the sinking of the Lusitania. In Vietnam, it was the Gulf of Tonkin incident. There have been others since. The important thing is not the degree to which the intelligence is deliberately distorted in each case; the point is that the U.S. engages in military action for far more substantial and political reasons than they claim. The surface explanations offered—preventing massacres, protecting civilian life, containing weapons of mass destruction—always have a “moral basis.” But morality simply has nothing to do with military and foreign policy, which is directed by the geo-strategic interests of Wall Street and the Pentagon. So again, to the extent there has been a shift in military policy now, what is the cause? It quite clearly is to prevent the defeat of the Free Syrian Army, recently defeated in Qusayr by combined government and Hezbollah forces, and now generally in retreat. If the Syrian Arab Army is able to retake the economic center of Aleppo, which the rebels have admitted they hold with little popular support, the back of the rebellion may be broken. The coming negotiations between the two sides, hosted by the United States and Russia, will take place in a context in which the facts on the ground give all the leverage to the Assad government. Instead of a discussion about a transition government that would remove Assad from office, he could retain his office at least until next year's elections, if not longer. This matters, not because U.S. imperialism is unable to live with Assad in the abstract; it matters because they have declared his government illegitimate, announced that he must go, and used intense economic, military and diplomatic pressure to bring about regime change. A decisive defeat of the rebels would mean that Assad would have won, that one can defy the Empire and survive. A decisive defeat of the rebels would mean that Assad would have won, that one can defy the Empire and survive. That indeed is a dangerous scenario, not for the workers of the United States but for the Empire itself. Its power, projected to friend and foe alike, is premised on its ability to make others cave and make good on its threats. A defeat of the U.S. regime-change efforts in Syria would be a huge setback for their strategic offensive against Iran, their main target looming in the background. It would confirm the viability of an Arab resistance axis, and reaffirm Hezbollah as a major regional player. It would halt the momentum Western imperialism gained in Libya, and then displayed in subsequent aggressions across Africa. On a global scale, it would further reveal the limits of U.S. power and mark the decline of its unipolar system, while strengthening China and Russia. It would damage the Gulf monarchies, who have so far escaped the "Arab Spring" tumult, but who hoard so much of the region's wealth. While the Arab Spring has largely been contained and corralled by political forces who assume that Western power must be accommodated, not challenged, this would strengthen progressive Arab nationalist and anti-imperialist trends. The toppling of one of the last independent states in the area, by contrast, would all but assure U.S. hegemony in the region, and isolate Lebanese and Palestinian resistance forces. There is clearly a lot at stake in Syria. The U.S. ruling class understands this well, even if they have been divided on how best to intervene. Washington's military escalation follows their substantial political and economic investment in the struggle, and if the rebels continue to lose ground, the logic of escalation may lead to greater military intervention and a widening war. Such are the contours of the current battle. That neither side represents the program of the international working class does not mean the battle has no consequence to socialists. In fact, socialists only earn their credibility in the struggle against imperialism. Revolutionaries in the United States must work to stop "our" government's aggression against Syria, which has become a battleground for the future of the entire region.